We have rolled out a few new features in ClearContext Online over the last few weeks – Percentiles, Sharing and new Groups. 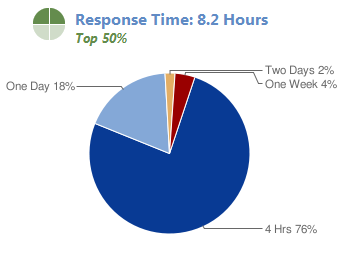 Want to see how your email usage compares with the rest of the ClearContext community? Percentiles have been added to your home and group pages, giving a clearer context for average received, average sent, and response time. Check out my user page to see this feature in action. While there, compare your stats to mine. Quickly share your individual stats with others via email, facebook or twitter. Share from the upper right hand corner of your home page in ClearContext Online. If you haven’t previously logged in, click Compare Your Stats Online from the Scorecard in Outlook. See more information on getting started with ClearContext Online. We have added several new corporate groups to ClearContext Online. Follow instructions here to join new ClearContext Online groups. If you don’t see the group that you want, send us a note at support at clearcontext dot com. Posted by brad at 4:04 pm on August 25th, 2009.